Add a dash of dapper to your look with Hank, a snazzy pocket square with a decidedly modern update--two interior pockets. One has a cushy microfiber lining to hold a phone or glasses; the other can carry items like cash, a credit card, or ID. 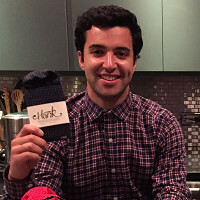 Hank pocket squares are the handiwork of two friends, Makers Liam Fayed and Louis Aronne. The idea came from a vintage eyeglass case that Liam uncovered in a British fashion archive. They realized the silk case’s soft lining could become a fun and functional update for the traditional pocket square. Made from a classy silk and cotton blend, Hank helps you looks sharp while holding your everyday essentials. It’s the handy dandy pocket square that keeps your pants pockets free. Hello Grommet! My name is Louis and I'm proud to let you meet Hank, the Pocket Square. I'm here to answer any questions you have, so fire away! I like the idea, but don't care to have that much sticking out of my pocket. I prefer a squared off peek of color. Any chance you'll develop other styles? Amy from The Grommet team here. Thanks for the feedback. The square pocket option is good idea for those who prefer that style. I'm sure Louis would love to consider this for his next style. This is his first product so he's testing the market - feedback from supporters like you is exactly what he's looking for. Hi @James- thanks for the feedback! Whenever I just want a squared off peek I simply tuck the top of the Hank into the main pocket so that you can only see a square bit coming out of the jacket pocket. The Silk is easy to maneuver and shape into different forms. We hope you give Hank a try! Amen. I prefer my pocket accent not to announce my entrance into the room... "His honorable Captain and Commander O' the Universe and his Pocket Square." You too can use Hank in Stealth mode! Just fold the silk top into the main pocket and you'll look sharper than a Four-Star General. @Doug Grommet CEO here--just to tell you I laughed out loud at your comment. I like your sense of humor. Is there anything that anchors this thing to your pocket? It would seem to be an easy target for a pickpocket. It would be easy to use a pin and attach it to the inside of the pocket. Let's see if Louis has any other ideas but that could be a simple solution. Hi John- Thanks a lot for your interest! I understand your concern. While there is no anchor, it is very easy to tell when the Hank is in or not given the weight of the smartphone or glasses in the Hank! Just an advertising thought: This is an elegant version of a pocket protector! They are quite lovely and I had the same thought about wearing them as a woman! Stacy- thanks for the idea and support! We actually have a lot of women using Hank not so much as a pocket square but actually as an iPhone case (although the Man Repeller has worn Hank herself). Hank looks great outside of the pocket, serves as an amazing wallet substitute and is also very easy to spot in a female purse when mixed among the many things! Louis - I'm really digging this idea and glad you brought it up as a possibility. I might have to get one myself now. I would like to buy one for my husband who wears a black suit to work at a funeral parlor. None of the colors shown seem to go with a black suit. Do you have something in black and it is just not being shown? How about one with linen instead of silk? My husband would never wear will anything. @Susan The next to the last word above should be "silk"
Louis will love this idea - lots of men (and women) would be interested in linen. Especially in summer. Perhaps by next summer this option will exist. Stay tuned. Add a dash of dapper to your look with Hank, a snazzy pocket square with a decidedly modern update--two interior pockets. One has a cushy microfiber lining to hold a phone or glasses; the other can carry items like cash, a credit card, or ID. 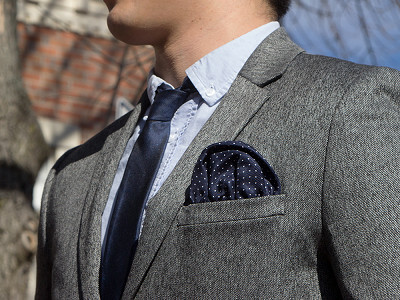 Hank pocket squares are the handiwork of two friends, Makers Liam Fayed and Louis Aronne. The idea came from a vintage eyeglass case that Liam uncovered in a British fashion archive. 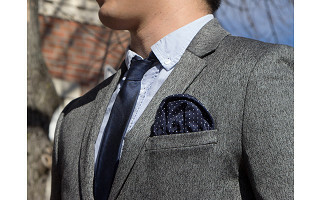 They realized the silk case’s soft lining could become a fun and functional update for the traditional pocket square.